Balancing Jane: The Role of Fatherhood? For the record, I feel much more professionally trained to answer the Google question than the father question, but that didn't stop me from reacting pretty strongly to the questioning the necessity of fathers. Most of the data fail to distinguish between a father and the income a father provides, or between the presence of a father and the presence of a second parent, regardless of gender. That "traditional division of family labor" part is what caught my eye. 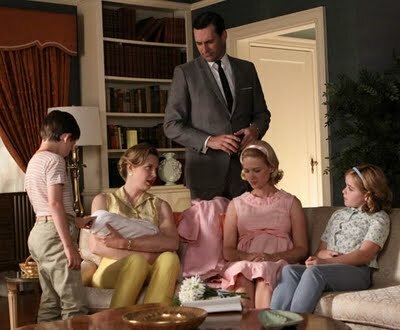 I envision this "traditional" breakdown to be something like the complete black-and-white division that takes place in the Mad Men-era. This division is of course magnified in retrospect (and art), but it also makes a lot of assumptions about the situation of the family. In order for the man to participate in the "traditional" roles, he must be finacially successful, since the majority of his role revolves around providing income. He must also conform to other masculine stereotypes, namely a cool detachment from the personal side of parenting. Don Draper is little concerned with a scraped knee or a lost stuffed animal. I suppose if you're using this model as your yardstick, it would be pretty reasonable to assume that two parents who are paying attention to their kids as people and who are both involved in the day-to-day management of a household would be more effective than one parent doing all of this. In this model, of course, the money has to come from somewhere, so that's either a shared responsibility, a non-issue, or something that one of the parents provides in addition to the caregiving. “'Even women who want their husbands to help more with the kids don’t want to give up their traditional authority,' says Stephanie Coontz, director of research at the Council on Contemporary Families." It's at this point where I begin to lose the thread. Paul's ultimate conclusion (which rings true but not particulary satisfactory or earth-shattering) is that "we still live in a culture with a deeply embedded notion of what a father is." But my interest is in who is working so hard to maintain that embedded notion. Coontz's claim that women don't want to give up their "authority" suggests that it is those same women who are trying to maintain the traditional gender roles. If so, I would argue that the attempts to maintain authority over the household and caregiving are pitting women into dualistic identities: they must adopt a defensive, perhaps even aggressive, (masculine?) role in order to maintain a more passive, nurturing (feminine?) one. And what motivation do women have for doing this? Are they afraid that the "power" lost from this role will not be balanced out in other ways? I guess what I took from this article is a deep-seated hypocrisy: women who are crying out that they want a more equal partnership while also working to make sure they are really in control of all of their "traditional" aspects of that partnership. Check this out on the challenges of equally shared parenting: http://equallysharedparenting.com/articles/article2.htm. The book Halving It All: How Equally Shared Parenting Works is also a very interesting read.